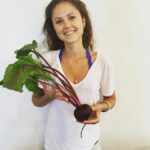 Join Jasmine Silverstein of HeartBeet Foods for a hands-on workshop, “Make Your Own Pickled Veggies & Yogurt,” to learn the step-by-step process of making your own fermented vegetables and probiotic-rich yogurt on Saturday, August 18, from 10am – 1pm at Volcano Art Center Niaulani Campus in Volcano Village. The class will focus on lactic-acid fermentation, or fermentation by naturally occurring anaerobic bacteria. We will also discuss the health benefits of fermented foods in the diet. A variety of vegetables will be available to pickle; including cucumber, carrot, daikon, and others. The other half of the class we will learn how to make yogurt at home using dairy of choice, and we will discuss methods for dairy-free yogurt. Each student will take home their own fermented vegetables and yogurt culture! Cost for the workshop is $55 and $50 for VAC members. All supplies and Organic ingredients will be provided. No cooking skills necessary, just an interest in real, whole food. Fermentation is an Art not a Science… It’s flexible and fun, not rigid or difficult.